Fracking can play a critical role in making the Northern Territory one of the world’s largest natural gas exporters, unlocking an estimated 240 trillion cubic feet of gas, 10 times more than the Ichthys project and Mereenie combined. This much cleaner energy source would replace the need for 30 million tonnes of coal. If – as expected – significant deposits will be found in The Centre, hundreds of jobs would be created in Alice Springs, to be filled preferably with locals and engaging a string of local suppliers and tradies. Fly-in, fly-out is not a preferred option. Fracking has been around world-wide for 60 years, 50 in Australia, and is currently under way west and north-east of Alice Springs. There are 2000 fracked wells in the NT, WA, SA and Queensland. 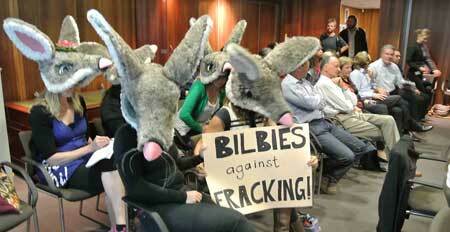 That was the thrust last night of an address to the Town Council and a packed public gallery – including environmentalists wearing bilby masks (photo above) – by Colin Cruickshank, General Manager of Unconventional Resources & Exploration of Santos. The company has a long association with The Centre as the operator of the Mereenie and Palm Valley oil and gas fields since 1984. Questions were limited to councillors – and there were many. The protesters were orderly, limiting their dissent to shaking their heads. Mayor Damien Ryan said it was clear that the issue of fracking required a forum at which the public could ask questions. Mr Cruickshank, speaking for representatives of four other oil and gas companies present at the meeting, said they would be available to take part in such a meeting. He was predictably bullish about the industry but got a fairly thorough grilling from Councillors Jade Kudrenko, Eli Melky, Liz Martin and Deputy Mayor Kylie Bonnani. Last week the CEO of the local Arid Lands Enviromnent Centre, Jimmy Cocking, alleged that the industry did not have “social license” for fracking. The Alice Springs News Online disclosed that the Central Land Council had made a deal with StatOil. After Monday’s council meeting Mr Cocking, in reply to questions from the News, said it was clear the land council was motivated by financial considerations. “Our concern is that the traditional owners are not getting the full picture about fracking,” says Mr Cocking. Mr Cruickshank told the council the product of fracking is no different to that of conventional gas production – methane. The difference is that fracking gives access to trapped gas that is left in porous rock. These “tight zones” are “stimulated” by forcing water (90%) and sand into them under high pressure. About 1% of the fluid consists of chemicals that increase its viscosity, gels into wedges that keep cracks open so gas can flow once the fluid is taken back out, and prevents the rusting of the bore casings. The chemicals are not unlike what’s used in toothpaste and ice-cream, said Mr Cruickshank:. Most of the chemicals stay under ground when fracking is completed. Nevertheless, the reclaimed fluid is contaminated and can’t be used for anything else. A method is under development to recycle it for further fracking, but until that is found, the fluid needs to be disposed of. That is done by evaporating it or pumping it into underground cavities where it can do no harm. The key safety measure is the engineering of the pipes: they are made from high quality steel and surrounded by concrete. In they next five to 10 years, “depending on early success,” there will be “tens or hundreds” of wells around Alice Springs. Safety and local benefits were the main issues of councillor questioning Mr Cruickshank. The following is a summary of the main questions covered. Cr Melke: Will gas become cheaper? Mr Cruickshank: Gas in the US was $12 to $14. Now it is less than $4. It’s an issue of supply and demand. Cr Melke: Do the companies pay bonds up front covering the costs of any accidents? Mr Cruickshank: We are not required to, neither by NT nor Federal legislation. Cr Kudrenko: Pollution of water would have long term impact. There is a high water use. In the US there are documented cases of contamination near fracking sites. Can it happen in the exploration phase? Mr Cruickshank: Yes – but we have been in the Cooper basin 40 years, drilled 3000 wells there, of which 1000 were freaked, and no harm at all has been done. Cr Kudrenko: Will you disclose how much water and what type and quantity of chemicals you will be using? Mr Cruickshank: We have to make a full disclosure. The NT Department of Mines and Energy should have it on its website, if not, contact us. Cr Kudrenko: How is the water used? Where does it come from? How it is monitored? Mr Cruickshank: It can come from surface sources or bores. We find bores when we drill. We don’t need stock quality water, brackish water can be used. Monitoring occurs before, during and after production. Cr Kudrenko: I understand you will be using 10 million to 200m liters per hole. Mr Cruickshank: It’s more like 1m to 20m. Cr Kudrenko: Are the chemicals hazardous? Mr Cruickshank: Yes. So are household bleaching chemicals. Cr Kudrenko: Can there be radioactive contamination? Mr Cruickshank: I have not seen it in our operations in 50 years. If there are naturally occurring radioactive materials we would check the risk and we may not continue in that location. Cr Kudrenko: How is the gas transported? Mr Cruickshank: There is a small Mereenie to Darwin [and Alice Springs] pipeline. Maybe we’ll have a twin pipeline. Cr Kudrenko: What is the local benefit, other than buying shares in your company? Your staff would no doubt need high qualifications. Mr Cruickshank: Yes – but we also need a wide range of workers, from crane drivers to scaffolders, including unskilled people. We would provide training, including for Indigenous people. Cr Bonanni: Would Mereenie gas in bottles be available to residential houses? Mr Cruickshank: We have gas for sale in Mereenie today. We would welcome a distributor, a gas retail company, such as Origin. They would use buried pipelines. Cr Bonanni: What are risks? The negative outcomes? Mr Cruickshank: I recommend the report “Engineering Energy: Unconventional Gas Production” prepared by the Australian Council Of Learned Academies. (ACOLA), based on proprietary and publicly available information. At Moomba we drill 150 oil and gas wells a year, 1000 people work there. Cr Martin: There will be extra use of our roads. Will you subsidise their maintenance? Mr Cruickshank: Too soon to say in the NT but in South Australia we maintain many public roads around our operations. We will build new roads if our operations require it. Certainly there exist concerns fracking might cause problems, so caution is high. Best to read the inconvenient facts. There were in 2012 around 145,000 such wells in the USA with 309 in Colorado, according to the Colorado Geological Survey. The Colorado Oil and Gas Conservation Commission (COGCC) monitors the wells in Colorado, they found NO such evidence, issuing a four-page clear rebuttal to the fracking pollution claims in Weld County. COGCC halted one of the Weld County wells after the May 31 2014 earthquake rated 3.2 magnitude for first time indicated natural seismic activity caused damage with a possible link to the preferential pathway for wastewater disposal flowing from bottom of one well into basement rock far beneath. So they do look for problems ! Read Australia Institute’s March report “Fracking the Future: Busting Industry Myths about Coal Seam Gas”. Set out are the various myths, unfounded claims from anti-coal seam gas activists around Australia. There exist numerous government, corporate and independent reports, required prior to development proposals obtain approvals, as well as regular updates, available for public viewing. There is no doubt that Fracking causes problems. There not a day that questions are being asked and decisions reversed regarding fracking in Colorado and other States. Just the amount of water used should be a major conceren for the Territory. Then there is the problems of water becoming inflammable with the leakage of gas into the water table. Having lived for a time in Weld county north of Denver, I have seen the results caused by fracking. There is also the sludge, the smell and the ongoing damage to the environment after the fracking team moves to another location. You only have to view the “Denver Post” and read the articles resulting in the ongoing fracking in different States. As I have written before, don’t let them frack up the Territory. These companies will tell you anything to get what they want. Also check that the government does not cut any special deals allowing them use of chemicals that will not be named as was the case with “Bush and Cheney”. You should be made aware of what chemicals are being pumped into the ground and will gradually make their way into the water table. Once the damage is done there is no going back. I wish you all the best in this ongoing battle. As usual, industry representatives are loose with the truth – or disingenuous. While fracking has been a round in the CONVENTIONAL oil and gas industry, the techniques used today in the UNconventional industry are much newer and if reports coming out of the US show anything, it is that there are serious pollution and contamination issues that have not been resolved. The industry has tried very hard to silence complaints and bury unfavourable reports. Don’t take industry assertions about safety lightly. Do your own research. Don’t believe the rubbish about cheaper gas either. As soon as Australia starts exporting, the price will be linked to the East Asian price and it will go up. A LOT. Again – there are many articles and reports from respected economists and finance analysts “out there” that make this very clear. Don’t believe the industry’s spin. They are masters of it. Will the tax / price for sunlight, or wind, as energy sources go up at same rates? It makes me so upset that we have to prove they are not safe rather than they prove they are safe (beyond saying “we’re safe”). No margin for error, however small, is acceptable when it comes to our water supply. Sorry, Jimmy. I didn’t realise my ironic response to this admittedly serious topic would go so far over your head. @ Hal: A senseless response to a serious issue. The remaining sludge is not useful for anything except being disposed of, there is no “de-risking” of this industry, only management thereof. Domestic prices will increase as gas is sold on the international market. The US sensibly has policies to protect its domestic reserve. Australia has none. Therefore, Aussie gas will go global and domestic prices will go astronomical. If the politicians actually cared about us – we would have a sovereign wealth fund to support future generations rather than being frittered away as general revenue from royalties. Also, note that there is a long way to go here. The NT Government is spending $8m over the next four years for shale gas development – yet all gas companies will still be in the exploration phase which won’t result in any gas being pumped and hence royalties for more than five years. That $8m would be better spent on developing the renewable energy which does have a proven resource. Are we absolutely sure that the contaminated fluid recovered post-fracking cannot be used for anything else? Is there no chance of it being reconstituted as a toothpaste, or as an ice cream? Perhaps under a Bilby logo? I see an export market here, once it’s all been “de-risked” of course. I could really pick all his answers to pieces … but I will start with one small and simple question: Why did he mention US gas prices, which is domestic price … why not discuss the 17% overnight increase in gas prices in Queensland when they shifted to global market? It has already been stated at pro unconventional oil and gas evening held in Katherine, that our gas prices will rise. And even though [NT Mines Minister] Willem Westra Van Holthe has said these prices are contracted until 2034 (? ), Origin Energy representative has said there will be a very noticeable increase. Why in his answer, did Mr Cruickshank fail to explain how Queensland is now going to increase use of coal to generate power as this is the cheaper (and yet dirtier) fuel?